On Wednesday, women across America will participate in the “Day Without Women” strike, which aims to highlight the often underappreciated economic power of women. 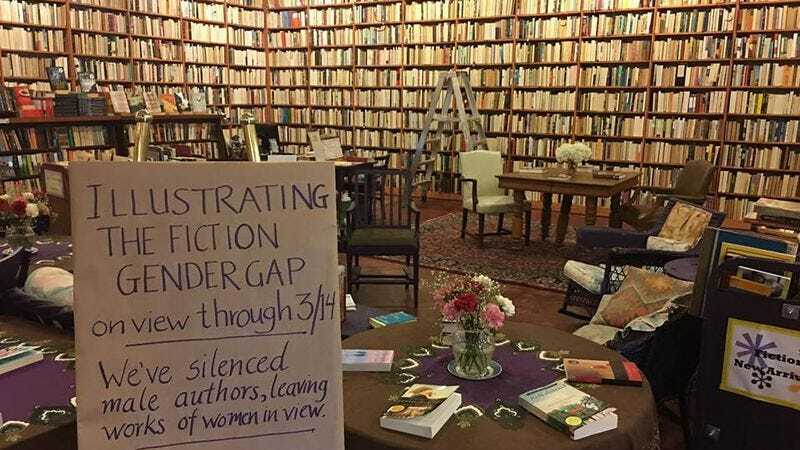 In a similar vein, the staff of Loganberry Books in Shaker Heights, Ohio decided to send a concrete visual message about women and culture—only theirs emphasizes the lopsided ratio between male and female authors. The staff of the independent bookstore adjusted the shelves of their general fiction section so that books written by men are turned backward, with their white pages facing out. That leaves only the spines of books by women facing forward. Although the disparity between male and female authors speaks to biases in the contemporary publishing world (that’s one reason so many female authors like J.K. Rowling use their initials rather than their full names), it also serves as a reminder of just how male-centric the literary canon is. And it’s important to remember that that historical disparity comes down to a lack of opportunity rather than a lack of talent or interest. After all, what makes Jane Austen an outlier isn’t that she wrote novels, but that she happened to come from a family who actively pushed her to publish her work and advocated for her within the male-dominated publishing industry. There’s presumably an entire lost canon of female authors whose work never saw the light of day because either their families or societies discouraged them from trying to publish. Loganberry’s art piece emphasizes the concrete impact centuries of bias have had on our ability to read books written by women. Loganberry Books will leave their shelves this way through March 14. To learn more about Loganberry or purchase a book, you can visit the store’s website.